A passionate young woman's search for a rewarding and meaningful life unfolds in Middlemarch, an English town taking its first steps toward modernization. From tradesmen to gentry, the provincial community's residents form a microcosm of political and social change during the 1830s. The shifting perspectives ― including those of idealistic Dorothea Brooke, ambitious Dr. Lydgate, prodigal Fred Vincy, and faithful Mary Garth ― provide a timeless array of observations on human nature, drawn with subtlety, depth, and humor. 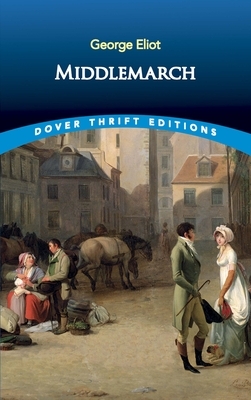 Virginia Woolf praised Middlemarch as "one of the few English novels written for grown-up people," and the story's thematic concerns range from the status of women and the rise of the middle class to morality, religion, and marriage. Rich in narrative irony and suspense, George Eliot's masterpiece will captivate readers of all ages. Born in 1819, Mary Ann Evans adopted a man's pen name to make sure that her books were taken seriously. As George Eliot, she became one of the Victorian era's most prominent novelists. Eliot's stories continue to captivate readers with their readable style and the warmth and humanity of their characters.